You'll love Grandma's iced tea recipes. They make delicious iced teas that truly refresh. As a bonus, these old fashioned beverages contain only wholesome, all-natural ingredients, and you control the sweetness. Think healthy. I'm not a hot tea drinker, but I do love a tall glass of sweet iced tea, especially in hot weather. It's a drink that truly refreshes and satisfies. Be sure to try the iced teas flavored with mint, rhubarb, or wild strawberry. 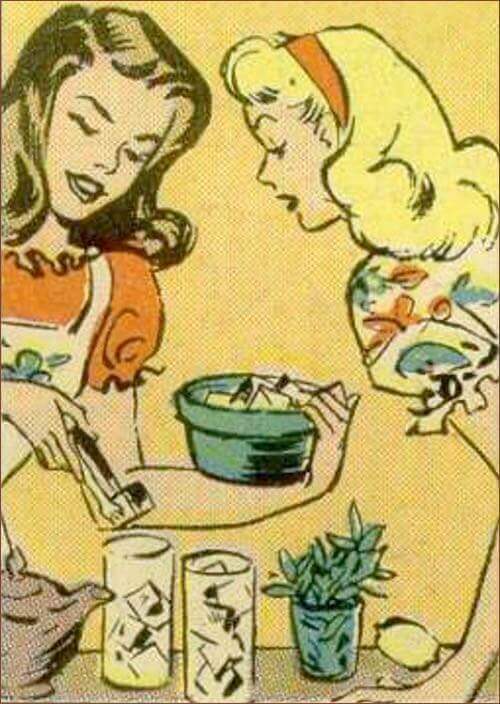 And nobody can resist the recipe for Southern iced tea. It's so refreshingly different! 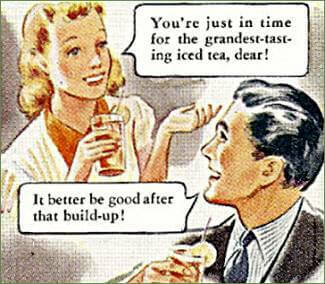 Enjoy a delicious ice-cold beverage from the past. You'll find the taste much nicer than today's commercial tea beverages, and they're healthier too, as you get to control the amount of sweetener to add. Fresh mint, 1 large handful; black tea leaves, 4 heaped teaspoonfuls; water, 4-1/2 cups; sugar, 1-1/2 cups; juice and rinds of 2 lemons, or 1 orange. To make concentrate, place mint in 2-quart container and bruise slightly. Add tea leaves; boil water, and pour over mint and tea. Cover and steep 5 minutes. To make iced tea, place 1 cup of concentrate, plus sugar and lemons or orange, in 2-1/2-quart pitcher. Fill with cold water and add ice cubes. Tea freshly brewed, 1 quart; juice and rinds of 2 lemons or 1 orange; 1 lemon, cut into thick wedges; sugar, 1-1/2 cups; rhubarb to taste. Mix together tea, rhubarb, lemon, and sugar. Cook until rhubarb is tender. Strain and cool. Pour over broken ice in cups or glasses. Delicious! 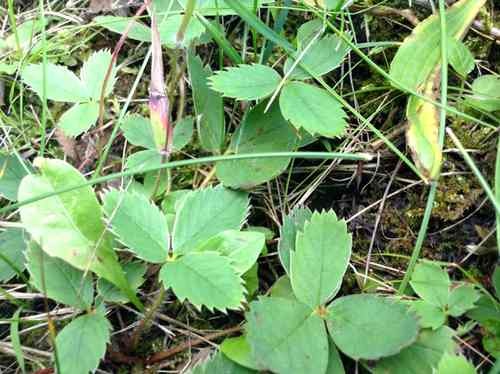 Take a generous handful of fresh (or dried) wild strawberry leaves (Fragaria virginiana) and steep in boiling water. Sweeten if necessary with sugar or honey. Chill. The flavor is very subtle when properly made. Allow a teaspoonful of tea for each cup, put the tea in a porcelain-lined or china teapot, and pour as much cold water on it as you require for your tea. Set this in ice-chest for twelve hours or more. You will find this tea more delicate in flavor than when prepared with the boiling water. It will not have any bitter taste at all, which tea made with boiling water always has, if allowed to stand any length of time. Prepare tea in the morning, making it stronger and sweeter than usual; strain and pour into a clean, stone jug or glass bottle, and set aside in the ice chest until ready to use. Drink from goblets without cream. Serve ice broken in small pieces on a platter nicely garnished with well-washed grape leaves. 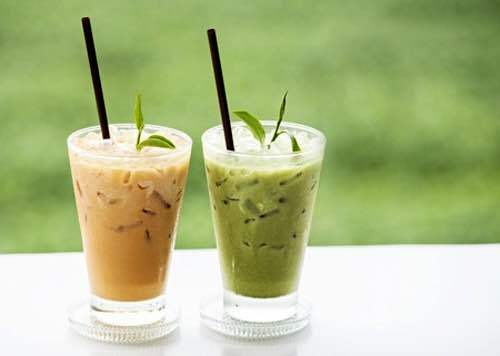 Iced tea may be prepared from either green tea or black tea alone, but it is considered an improvement to mix the two. Tea made like that for iced tea (or that left in the teapot after a meal), with sugar to taste, a slice or two of lemon, a little of the juice, and some pieces of cracked ice, makes a delightful drink. Serve in glasses. The following old fashioned recipes were once used to make refreshing iced beverages for guests at the White House in Washington, DC. Iced tea is now served to a considerable extent during the summer months. It is, of course, used without milk, and the addition of sugar serves only to destroy the finer tea flavor. It may be prepared some hours in advance, and should be made stronger than when served hot. It is simply bottled and placed in the ice chest until required. Use the black or green teas, or both, mixed, as fancied. Make more coffee than usual at breakfast time and stronger. When cold put on ice. Serve with cracked ice in each tumbler. Make tea in usual fashion except that you add two whole cloves to each cup of tea before brewing. Strain, and while still hot add sugar and lemon to taste. Pour through cheesecloth. Before serving put in each glass crushed ice, two or three sprigs of mint, which should be slightly bruised, and a maraschino cherry, and also a very thin slice of lemon with the rind left on. Now, you can make the prettiest glasses of sweet iced tea you can imagine. Simply follow the detailed instructions below. 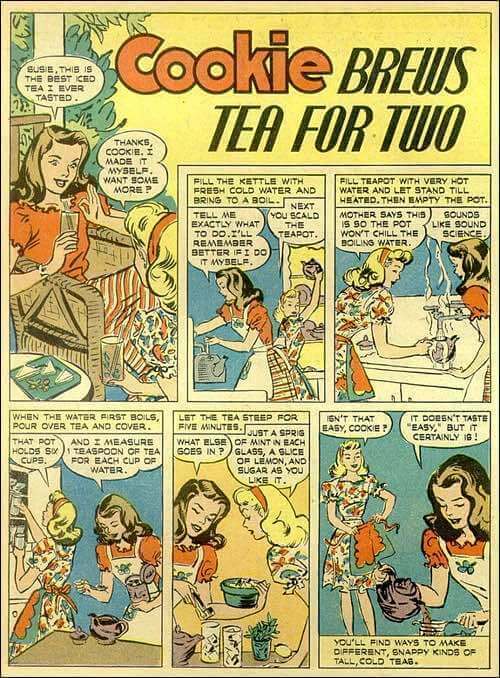 As Cookie demonstrates in the comic page above, fill the kettle with fresh cold water and bring to a boil. Next you scald the teapot by filling the teapot with very hot water and let stand till heated. Then empty the pot. This is so the pot won't chill the boiling water. Measure 1 teaspoon of tea for each cup of water. When the water first boils, pour over tea in teapot and cover. Let the tea steep for five minutes. Add ice, a sprig of mint in each glass, a slice of lemon, and sugar as you like it. After you've filled the glasses, strain the rest of the tea into a bottle. Cool and put in the refrigerator for "seconds." If you like the "punchy" type of iced tea, try adding sugar, lemon juice, orange juice, and a tablespoon of crushed mint leaves to the quart bottle before you put it into the icebox. And don't be horrified if it turns cloudy. That doesn't affect the flavor a bit, and the tea will clear when you take it out of the refrigerator. Another smart trick is to mix it half-and-half with grape juice. If you'd rather, you can steep the mint right along with the tea. Simply add a teaspoon of crushed mint leaves to the tea in the pot before you pour in the boiling water. Another trick is to put 2 cloves, 6 allspice, and a small bit of stick cinnamon into the pot to steep with the tea. Or put a bit of ginger root into the water, boil a minute or two, and use this water to make the tea. On a sunny day, you can make basic iced tea without heat. Put 2 tablespoons of tea in a quart bottle or jar — clear glass, please. Fill with cold water and set it in the sun for two hours. Strain the tea over cracked ice. Squeeze a big batch of orange (or lemon) juice and pour it into the ice-cube tray. In each section put something to freeze right into the cube — a leaf of mint, a maraschino cherry, a quarter slice of lemon, lime, or orange, strawberries, black pitted cherries — anything which you think would be good. Lots of kinds are more fun than all alike, and they make the prettiest glasses of iced tea you can imagine. The Prairie Moon Company can supply all your iced tea making needs, including authentic flavoring syrups, juicers, vintage glassware for serving, and other accessories.